Clear Channel Airports, a brand division of Clear Channel Outdoor Americas (NYSE: CCO), and a subsidiary of iHeartMedia Inc., today has announced it has signed a new 10-year agreement with the Port of Seattle to provide a benchmark-setting media program at the Seattle-Tacoma International Airport (Sea-Tac). 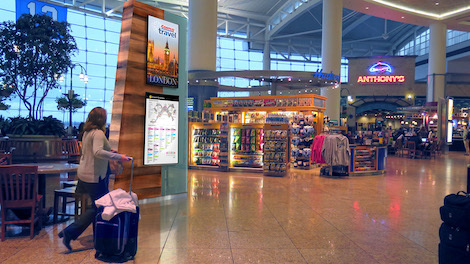 Clear Channel Airports aims to transition Sea-Tac and its valued advertising partners seamlessly into a stunning, architecturally integrated media advertising network. Clear Channel Airportshas been the premiere display advertising provider for Sea-Tac since 2007 and was awarded the new 10-year contract via a competitive request for proposal process against other major competing outdoor media companies. The new partnership went into effect August 1, 2017 with the new advertising program launching in 2018. The new partnership will include a highly integrated and aesthetically anchored design and fixtures that will compliment architecture and passenger flow at Sea-Tac, attracting global, national and local brands to reach its over 45 million annual travelers. Sea-Tac and the city of Seattle continue to experience tremendous yearly growth with the Puget Sound region serving as home to some of the largest companies in the world including Amazon, Microsoft, Starbucks, Costco, Alaska Airlines, Nordstrom, Nintendo of America and multiple technology/e-commerce companies such as Expedia, Zillow, Concur and PayScale. Sea-Tac is one of the fastest growing large hub airports in the U.S. for the past three years. Moving up four spaces to the ninth busiest in the country last year, Sea-Tac has a regional economic impact of more than $16 billion in business revenue and generates over 170,000 jobs and more than $565 million in state and local taxes. Currently, Sea-Tac’s 30 airlines serve 88 domestic and 24 international non-stop destinations. o Baggage claim digital LCD network – full bag carousel coverage including 100% of arrivals exposure and extended passenger wait times. o Exhibit spaces for specialty displays/booths, experiential and branding/sponsorship opportunities. o Pedestrian breezeway banners connecting SEA passengers to the Sound Transit light rail link. Operated by the Port of Seattle, Seattle-Tacoma International Airport (SEA, KSEA) is ranked as the 9th busiest U.S. airport, serving nearly 45.7 million passengers and more than 366,000 metric tons of air cargo in 2016. With a regional economic impact of more than $16.3 billion in business revenue, Sea-Tac generates 171,796 jobs (109,924 direct jobs) representing over $2.8 billion in direct earnings and more than $565 million in state and local taxes. Twenty-four airlines serve 83 non-stop domestic and 24 international destinations. This entry was posted on Thursday, October 12th, 2017 at 19:39 @860 and is filed under DailyDOOH Update. You can follow any responses to this entry through the RSS 2.0 feed. You can leave a response, or trackback from your own site.